The nearby mountains, beaches and forests afford a variety of excellent hiking venues. The tremendous beauty of this place entices me to explore it at every opportunity. I am truly blessed. 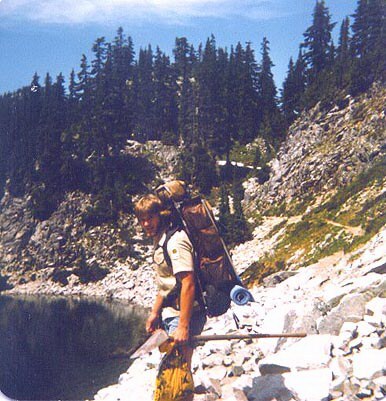 This is me, circa 1981 working as Wilderness Ranger in the Alpine Lakes Wilderness. Note the obligatory forest service shovel and litter bag. A radio the size and weight of a large brick was also standard issue. It was a great summer, backpacking 5 days a week, cutting logs off the trail (by hand, no chainsaws are allowed in Wilderness areas), picking up litter, planting trees, putting out fires, searching for lost Boy Scouts, collecting water samples, recording user impacts, rendering first aid and proselytizing to the masses about the benefits of low impact camping. Ultralight Backpacking Transition from gear head to minimalist. Mount St. Helens A truly amazing place.
" The reward is in the Journey"